Some late-round birdies put the Govs in fifth with a 306 after 18 holes, three shots ahead of Tennessee Tech and five behind Belmont. Murray State (291) leads the way, with Jacksonville State (294) and Eastern Kentucky (296) rounding out the top-five. A trio of Govs are in the top-20 with 36 holes remaining, helmed by junior Meghann Stamps’ 75, which places her 11th. The Hendersonville Tennessee native enters play Tuesday as one of only seven players in the field to average even par or better on par-3 (3.00 strokes per hole) and par-5 (5.00 strokes/hole). A shot back of Stamps and tied for 15th overall are freshman Taylor Dedmen and senior Reagan Greene, both with four-over 76s. 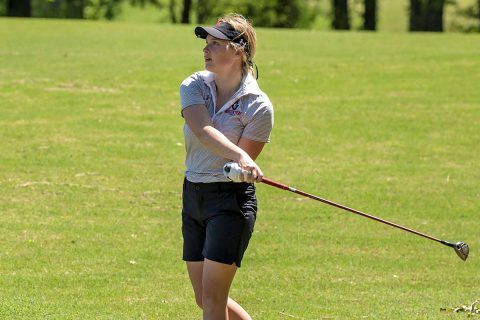 Dedmen birdied two of the final three holes to help the Govs put some distance between themselves and the Golden Eagles; she and Greene were the only Govs with multiple birdies in the opening round and were responsible for four of Austin Peay’s five birdies over the first 18 holes. Greene was Austin Peay’s most consistent performer, firing a 38 on the front and back nines, with a birdie and a trio of bogey’s on both sides of the turn. Her birdie on the 307-yard, par-4 at No. 13 was one of just three sank in the opening round. Twin sisters Taylor and Ashton Goodley rounded out the Austin Peay lineup. Taylor Goodley overcame a tough start with three bogeys on the first three holes; she was just three-over on the back-nine and is positioned well for a Day Two move up the leaderboard. In her final appearance in the OVC Championships, Ashton opened with a first-hole par—the only Gov to post par or better on Hole No. 1—en route to an 82. Head coach Amy McCollum was optimistic at the end of Day One about the Governors opening-round performance. Day Two action begins for the Govs at 8:50am, Tuesday; Austin Peay State University will pair with Belmont and Tennessee Tech.